Registered nurse, table & rpg gamer, recreational cyclist, lover of the outdoors, wanna be writer. Gary Con Recap: better late than never. Just to finally sit down and do some writing has been a chore. I never quite know where to start. I’m continually looking for the great opening line. And it never really comes. I arrived on the Wednesday before Gary Con to the Grand Geneva Resort. It’s awesome to arrive on Wednesday the day before the con starts. You can get settled in your room, then relax by walking around, meeting friends in the bar area, and hopefully getting into a pickup game. The bar area was my stopping point. Members of the DCC RPG tribe were there and we started talking and having fun. 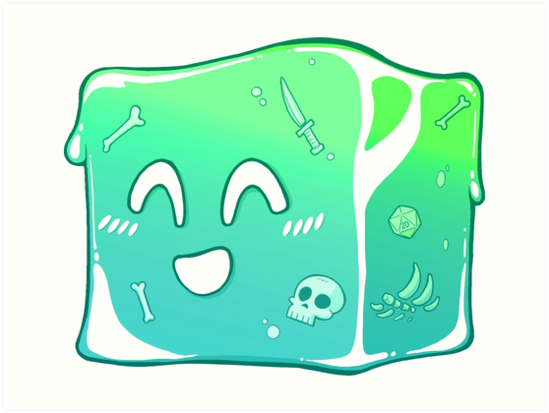 I like to describe the tribe as the warm, fuzzy gelatinous cube. Gary Con has to be the best gaming con ever. Now, why do I say that? I’m no expert on going to gaming conventions. I only started going to gaming conventions in 2017, starting with GenCon 50. I’d won a Goodman Games Road Crew contest. First time at a gaming convention and the first time I’d run events at a gaming convention. What an experience. I went back last year, 2018 and ran six DCC RPG events. In so doing, Joseph Goodman placed a silver DCC medal on me. Wow! 2018 was my first time going to Gary Con. Gary Con X. I went as a player and loved every minute of it. I was glad to be able to get a room at the Grand Geneva again for this year. And this year I went as a Game Master and ran the playtest of a module I am writing “Feast of the Mün Queen”. It all started out as an “off the top of my head” idea for a themed game night at a local bookstore. Initially titled “Pearl Jean’s Peculiar Portentous Potluck”. “Feast of the Mün Queen” was playtested four times during Gary Con XI. All tickets were taken except for two. I ran three of the four events over four hours each. The last event was ran at five hours. I was glad for this as it lead to some discussion time. I want to thank the players in all my events for taking notes and willingly giving them to me. As this is the first attempt at creating an adventure and writing one, I appreciate the feedback. If you are coming to Origins Gaming Fair, look me up. Just look for the table with the GM and players wearing pillbox hats. The immediate feedback was one of smiles and laughter during game play. It is a crazy adventure of attending an elegant dinner for a cookbook release and author signing. Things go awry when the food begins to cause “indigestion”. It was a blast to run this idea for a module and the comments during play and after play were and are encouraging. I definitely love to hear lots of laughter and the rolling of dice. You want to do that? Why sure! Roll me a … save! One of the things I do regret about the weekend is not scheduling enough down time to regroup and just enjoy being around the tribe. I scheduled so much into the convention time that socializing had to take a “back seat” almost. I was rushed from here to there. Highlight of the weekend? Oh my, do I really have to choose? Jim Wampler’s MCC game “Tomb of Horrors” hit a high mark. Jen Brinkman’s “Lankmar” game! The after con game with Bob Brinkman! This is a must if you are able to stay for Sunday evening. Bob did an awesome job navigating 20 players in an adventure on the sea as pirates. The best of all throughout the whole weekend was the laughter. There is nothing better than laughter! I wish I could write in detail every bit of fun and greatness that I experienced. I don’t know what could be better in the year yet to come. The weekend at Gary Con XI sums up the year already. It will be hard, in the months, to find a match to the weekend at Gary Con XI. Mün Queen”. Hope to see you there. Author joanAnewbeginningblogPosted on March 21, 2019 Categories RPGLeave a comment on Gary Con Recap: better late than never. It’s not about the stats! With every Dungeon Crawl Classics RPG (DCC RPG) session I judge, I learn something new. I learn that every player that comes and sits down at my open Road Crew table comes with their own perception of what roleplaying means. It has been quite some time since I was in high school where my extra curricular activity was drama club. And in growing up, playing with Barbie dolls, I pretended in many make-believe settings. The books I did read, I enjoyed seeing the world develop inside my head. I did not have stats that I made sure I was correctly playing. Yes, I wanted to be the most liked and see as the one who could do it all and come out of the game as the winner. But it was in playing and being imaginative with what I wanted to do and not set on stats. What happened to the creative imagination of those that are now in their twenties and thirties? I’m in my fifties now. I grew up in the ’60s and ’70s. I was in college in the ’80s. I discovered Dungeons and Dragons (D&D) in the 2010s. I knew of D&D in the ’80s. It was taboo. It was considered satan worship. Did I know what it was? Of course, I didn’t. I couldn’t get near a game and honestly, I was scared of it. I grew up in a conservative Christian home. Now, before you go all political on me, conservative, in how I’m using it means: holding to traditional attitudes and values and cautious about change or innovation, typically in relation to religion. I grew up in a Mennonite home. Not the conservative dress sect. But I do remember when my parents said that playing cards were not to be in the house or played with. I think, though, that by the time I left elementary school and started middle school, playing cards were allowed. My parents played “Rook” a lot with a group of friends that they invited over. It got to be a game group for them that they even rotated through each couple hosting the game night. We played a lot of board games. There were several years in the ’70s that getting a new board game or two was what we could expect as our Christmas gifts. One year, I think, between my twin sister and I, we got five board games. Family holiday gatherings were spent around the table with cousins playing board games for hours on end. Traditions and memories were made. I went on a tangent there that I didn’t necessarily mean to go on. The purpose of this blog post is to write about role-playing and what it is or at least what I believe it is. Role-playing is to play a role. What is a role? A role is an actor’s part in a play, movie, etc. This was the case at last Saturday’s Road Crew when I had a new player at the table who, get this is a D&D 5e player. And maybe I shouldn’t be so hard on the newer or maybe I should say younger RPG players. OMG, but those of you who are GMs, please STOP teaching your players that numbers matter! So, for the length of this blog and purpose of this blog, I have just hit on the reason for this blog. My ultimate message here is that “It’s not about the stats!” It’s not about the numbers! Yes, add the modifiers of the numbers you happen to have for your PC, but just because your PC may have a high number in Strength or Personality/Charisma does not mean that what you want to happen will happen. I don’t darn well give a flip about what number you have in a stat. Just tell me what you want to do and I will give you something to roll. GMs, please do not teach your players that they are playing stats. Please, let’s just role play by pretending you are your character. What would your character do? Build your PC to be a hero. Stats only matter in regards to what your dice will roll. Author joanAnewbeginningblogPosted on January 8, 2019 January 8, 2019 Categories dungeon crawl classics, role playing, RPGTags role playing, RPG statsLeave a comment on It’s not about the stats! For the month of November, there is a writing activity called National Novel Writing Month or NaNoWriMo. In 2011, I participated and wrote over 50,000 words in 25 days. It was a lot of fun. I wrote with abandon and was surprised at what came out of my head as a story. A mystery story which entitled “The Pretzel Twist”. Glady Rudd, living on her family’s farm was a baker of pretzels. Her next door neighbors have thirteen-year-old twins, a boy and a girl. The twins enjoy Glady’s pretzels and also playing on and around the farm. They discover some interesting antiques covered up in the Rudd barn. And the root cellar is more than what they ever expected. So now we are in 2018. Where did that story go? I wish I knew. It never got edited. Today I am working on another type of story. In the last couple of years, I have started gaming in role-playing. Specifically Dungeon Crawl Classics (DCC RPG). I started out playing some Dungeons & Dragons 3.0/3.5 but found it too full of rules. DCC RPG is full of rules or numbers. Basically through a dice in the dice chain, add a +1, +2 or +3 and you have what you need. Ok, so here is where I am at. I’ve bitten off the challenge of writing an adventure. Crazy. I am probably yet to new to RPG gaming that I will write something totally stupid and more than that, something that is totally unplayable. What if I get references to creatures wrong? What if I can’t even produce one good creature. Or even yet, what if I can’t produce a good story, one that people will like playing? Yet, just like with writing a book, the writer needs to know the audience. Or at least write to an audience. Do I know my audience well enough to write them something playable? If I take the advice that comes from my heart, I just write and see what comes from it. I was surprised and pleased with the story I wrote seven years ago. Can’t believe it was seven years ago. I can say that, yes, there are words written for the adventure. But I also have discovered that in order to write, I need to read. So, I’m trying to read and retain. Wow, as one gets old, retaining material that is read is harder. May you have wonderful gaming over the holidays. Happy Thanksgiving and may you have all that you wish for as the year 2018 comes to a close. We are well into October and I have set myself to creating, developing, and writing an RPG module. When put into this position, I find that I’ve suddenly become frozen and can’t seem to push the creative juices to move ahead. Backstory? Oh, boy, where has my main character come from. What will be interesting for my players to want to pursue the end of the adventure? I much enjoy the magic of the mountains in the Shudder Mountains which is the setting in Michael Curtis’ “The Chained Coffin” box set. I’m not a proponent of reinventing the wheel, but also I am not a proponent of “stealing” ideas or plagiarism. I do know Michael Curtis and have been in conversation with him. I’ve been advised on what I can and can not do. I am grateful for Michael Curtis’s advise. I hope you will be able to someday read and play what comes from this conversation. My players began with me doing something off the top of my head for a “Ladies Game Night” at a local bookstore where we play Dungeon Crawl Classics weekly. Life. Yes, life is distracting. Wow, I’m sure that is a new piece of information for you all…NOT. So, finding time to just sit and write is a gift. I don’t get gifts often. Therefore, I’ve not been gifted lately. I am trying with this blog post to spark some creative juices and see if they set a fire. When I don’t feel creative, I find that my mind can easily drift quickly to something else to do. Then, I am a guilty feeling person. The guilt sets in and I seek to find something that will get the creative juices following. It is a Catch 22 with me. Reading would be good, but then I feel like…oh, I need to be writing. Then when I turn to write, I’m thinking…I don’t have enough information to write. Ugh. Writers! I need your help! So, on with this cycle hoping that it will end soon. The organizing of ideas is a tough area for me. I’m not a seasoned writer, at this time, so I’m developing. Has anyone written a module that plays on one level and by the time the level is done, there has been enough XP to level up and move on to the guts of the adventure? So that you have almost two modules in one? As I mull over this question, I can list a couple that works in this way…”Sailors on the Starless Sea” and the tournament module, “The Carnival of the Damned“. So, yes, this blog has sparked some creative juices…I will see you on another day with some development of this crazy module idea. A Late GenCon 2018 review. Gathering myself after being at GenCon, I realize that time flew quickly by. It is more than a month after four days of glorious gaming and I’m just now writing. This past weekend was Hall of Heroes Comic Con in Elkhart, IN. I was a volunteer both Saturday and Sunday and ran Dungeon Crawl Classics on Saturday. This was the second annual Comic Con for Hall of Heroes and the first year for having a separate gaming area hosted by Secret Door Games where I run Road Crew games for Goodman Games Dungeon Crawl Classics RPG. But back to GenCon 2018. I ran six events for Goodman Games and was surprised to receive a silver medal for running the next highest number of events for Goodman Games. The good medal winner ran eight. It is a weighty medal. And I am most thankful to be a part of this “warm, fuzzy gelatinous cube” tribe. I ran two “Sour Spring Hollow” level 0 events, “Qnight’s Haunted Quest” and two “Sailors on the Starless Sea” events. And I love it how with each table of players the adventures run so differently. The players make my time judging DCC RPG worth every minute. On Saturday, I had my schedule of running events so messed up. But I didn’t miss a beat even though I was exhausted. Each day of GenCon I ran a total of 8 hours of DCC RPG in the Goodman Games gaming room. I also was able to play in a couple of games. I enjoy, so much, the fun of getting crazy “inside” a PC. One of my characters was in an X-Crawl game with Brendan LaSalle. Her name was Joan “of Arc” Rivers. We were asked to pick an actor to portray us in a movie and from there all chaos ensued. This is what I love about Dungeon Crawl Classics RPG, the gonzo play that it offers. I also play in another RPG group which plays a popular role-playing game. I don’t find it as enjoyable. So serious, or at least it was with a previous member of the group. As a new player, I was being taught that min/maxing a character was the norm. Then I was introduced to DCC RPG and the ‘casual” way of rolling up players. Ok, I think you all can guess what “casual” means. Old Gygaxian way – roll 3d6 and place the number straight down the ability line. Oh, this was liberating for me in character design. And the classes from the core book are straightforward. You are either human, elf, halfling or dwarf. And in leveling up, if you are human, you get to choose to become either a thief, warrior, cleric or wizard. At the time of leveling up a human, the ability numbers are fairly important as you can use them to your benefit. Clerics with high personality are nice and wizards with high intelligence are nice. Of course, agility for a thief and strength for a warrior are key also. Ok, so went for a bit of a tangent there. After four days of gaming and purchasing, I came home tired and with a lighter pocketbook. Yes, I still say pocketbook. Actually, I’ve been saying a cracked and broken plastic card. It has been well used purchasing Goodman Games products. Did I see any of the Exhibitors Hall? Well, yes, for a quick moment but for the most part, I spent most of my time drooling over the Goodman Games booth. There is so much wonderful stuff there and wonderful stuff came home with me. I want to thank Goodman Games for the support they give to their game masters during GenCon and at other conventions. The next convention I will be attending will be Gary Con in Lake Geneva, WI in March 2019. At that time I hope to have in playtest a module I am presently writing. We need more women writers in this genre. I hope you see my name there. Author joanAnewbeginningblogPosted on September 19, 2018 Categories UncategorizedLeave a comment on A Late GenCon 2018 review. The Writing Bug or Bugs in the Writing? In mid-April, I was struck with the “Bug”. The writing “bug”. So I wrote a little adventure starter for the “Gongfarmer’s Almanac” to be released at GenCon 2018 in August. A Keystone cop type theme. I titled it ” The Heist for the Royal Jewels”. It got play tested once during a BBQ party at my house. It was a blast as players from both Better World Books and Secret Door Games came to “test” this out. You can find my adventure starter in volume #5 of the “Gonfarmer’s Almanac 2018”. I dislike writer’s block. And the fact that every story needs the first words to get typed or written on a page. It also does not help to have chronic tendonitis in my left thumb and up the inner arm ending up in the shoulder. So, I am taking this time in writing my blog to get the writing juices flowing. Knowing that reading and watching themed books and videos can help with this, I am trying to get some time in on some well-needed Appendix N reading and also some theme related movies and videos. And listening to Queen’s “Under Pressure”. Thinking I have a good title for the module I am writing, I come to want to edit before the story is even written. “Cart before the horse”? Yes! So many things that I’m doing wrong with the writing process at this time. Looking for organizing strategy. So, I say there are bugs in the writing with having the writing bug. Author joanAnewbeginningblogPosted on September 10, 2018 September 26, 2018 Categories UncategorizedLeave a comment on The Writing Bug or Bugs in the Writing? Running MCC RPG for the first time. I ran MCC (Mutant Crawl Classics) RPG “The Museum at the End of Time” by Jim Wampler this past Saturday at Secret Door Games, Elkhart, IN. The SeDoTu Crusaders had a great time, along with this judge, as we crossed the Glow Desert and entered the museum. One player lost all four PC’s early on. I don’t like when players aren’t able to play. So, I try to be creative with where new PCs can come into the game. As with a group that had previously entered the museum, I chose to add another group that had gotten lost/found in the museum. The only thing about learning MCC is the mechanics of the Artifact Checks and the Artificial Intelligence check. Ok, you can laugh, but the “A” for both words confused me. “Oh bother. Which am I checking again? AI or Artifact?” Then I don’t know if I have the formulas correct. What do I check what against, again? I love to play DCC RPG and am falling quickly into playing MCC RPG. Just hope I can wrap my head quickly around the AI checks and the Artifact Checks. But first, I need to make sure that I am prepared for the six events I will be running at GenCon 51 on August 8-12 for Goodman Games. See you at GenCon. Author joanAnewbeginningblogPosted on July 16, 2018 Categories UncategorizedLeave a comment on Running MCC RPG for the first time.